The company was criticised last month after boards were placed outside its shop, and a closed branch of Next, in Oxford city centre. Rough sleepers had been using the doorway, in Cornmarket Street, for shelter. The temporary shelter and charity shop is to be run by Homes4All. It said it was approached by Lush who said it could use its old premises until the lease runs out at the end of January next year. 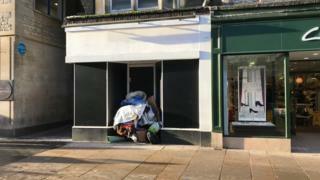 The Green Party group on Oxford City Council described the move as "heartless" as the doorways were being used for shelter by homeless people. Lush said it was "an error" and removed the boards, while Jesus College - landlord of the Next building - said homeless people were not being targeted. Homes4All - which will take over the shop - is attempting to convert a bus into a homeless shelter in Oxford. It said the former shop would act as a "stop-gap" until they raise enough funds and has asked the public to help them to decorate and furnish the building.